- Nearly 10,000 Life Application notes and features that help explain God’s Word and challenge you to apply its truth to your life today. - Profiles from the life experiences of the best-loved and most-despised figures in the Bible. 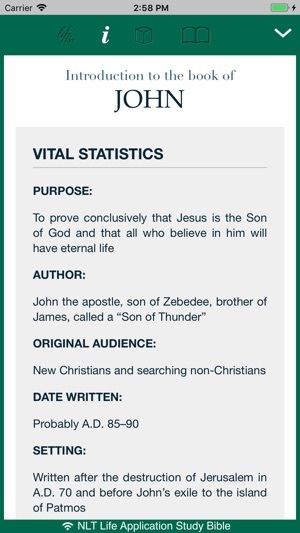 - A deeper understanding of God’s Word through vital statistics, overviews, and timelines. - Major themes outlined in short studies at the beginning of each book. - Over 200 maps and more than 260 charts along with the text. I have two copies of the Life Application study Bible (larger hardback & smaller softcover), because I love it so much. It really is an invaluable resource for understanding, learning, applying what you learn, and growing in your relationship with God. I would highly recommend it to everyone! I’ve even bought them for my new Christian friends, to help them learn to love reading the Bible as much as I do. 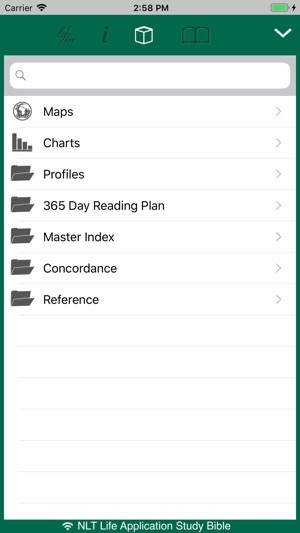 I just got the app because I wanted to have it with me on my phone for times when I don’t have one of my physical Bibles with me. I really like it so far, and I’m sure I will learn more neat things and cool features on it that I haven’t discovered yet. There’s only one thing I would suggest, that I was a little bummed about: you can’t highlight on the notes. You can highlight the Bible text, but not the notes. There is so much good information in those notes, and I have highlights and markings all throughout the notes in my physical Bibles - and I really wish it was possible to highlight them on the app as well. Other than that, I still love it! Thank you all for making such a great resource for us! I appreciate all your hard work - it has made a real impact on my life! 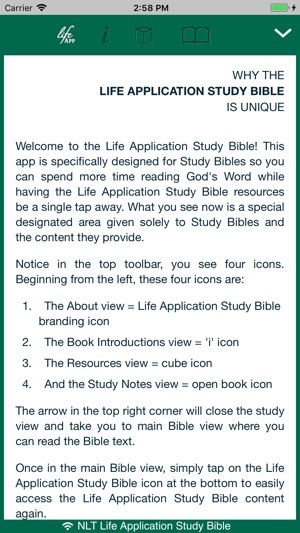 This app is everything I always wanted for my Bible Study. I especially love being able to have the King James Version side by side with the Life Application Bible. I love having the footnotes right there. 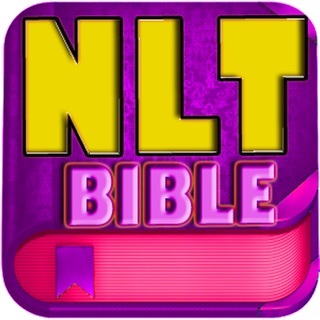 I can find any part if the Bible in seconds. Whoever designed this app is a genius! I love that I can take notes right there on the page. I love being able to save the notes and send them to others. 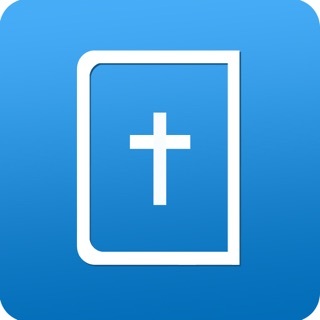 This app has been a blessing to our Bible Study group. It is FABULOUS!!! 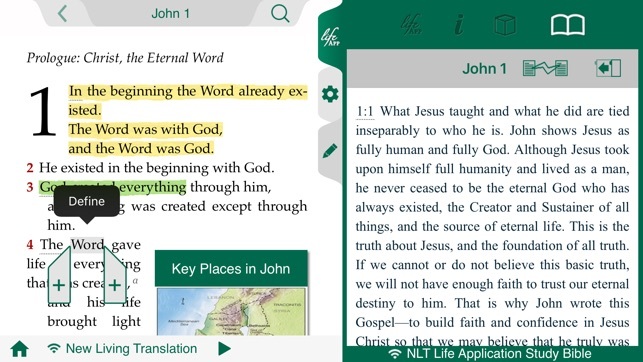 I really like this app it has everything I want and need to study God’s Word by using my cell phone and iPad when traveling or when I am on my lunch break at work. 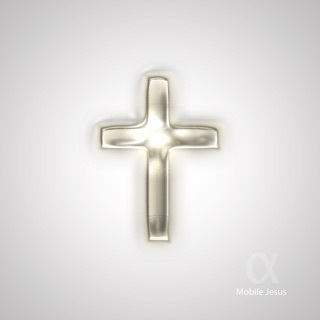 It’s just like having my Bible book with me except it’s on my cell phone. It’s very easy to use. And I like that it has icons I can click and it explains the chapter or certain verses. And whole lot more extras that helps me study Gods Word.